Can you believe Christmas is only six months away? Ugh! I'm enjoying summer so much, I can't even bear to think of cold and snow again. Well, let's try to not think about that. 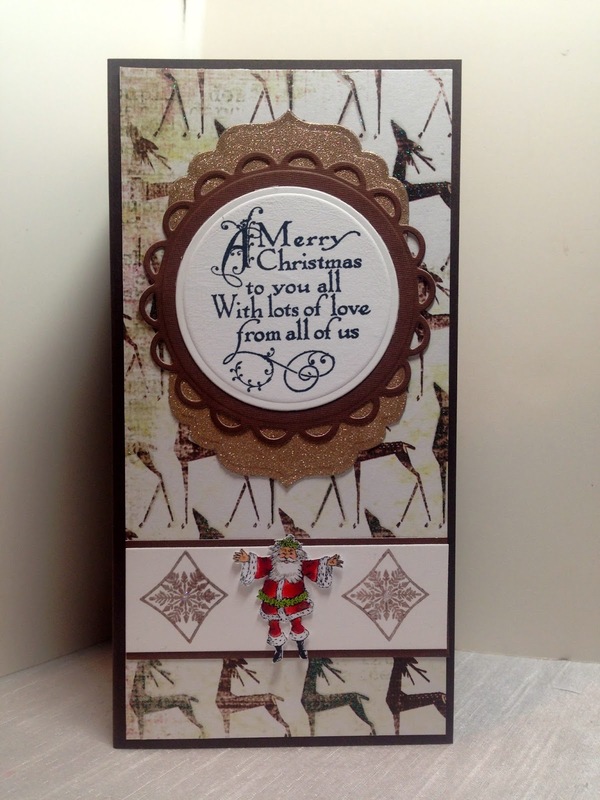 As most of you already know, I play the Splitcoaststampers Christmas Card Challenge where we make Christmas Cards all year long so that were not stressed out during the busy holiday season. I make five cards a month so that I will have about sixty cards at the end of the year. I make a long card, 4 x 8, so that I can put a photo collage and a Christmas letter inside the card. I normally try to keep my cards down to two layers so that they don't cost extra postage, but sometimes I break that rule, as in today's cards. 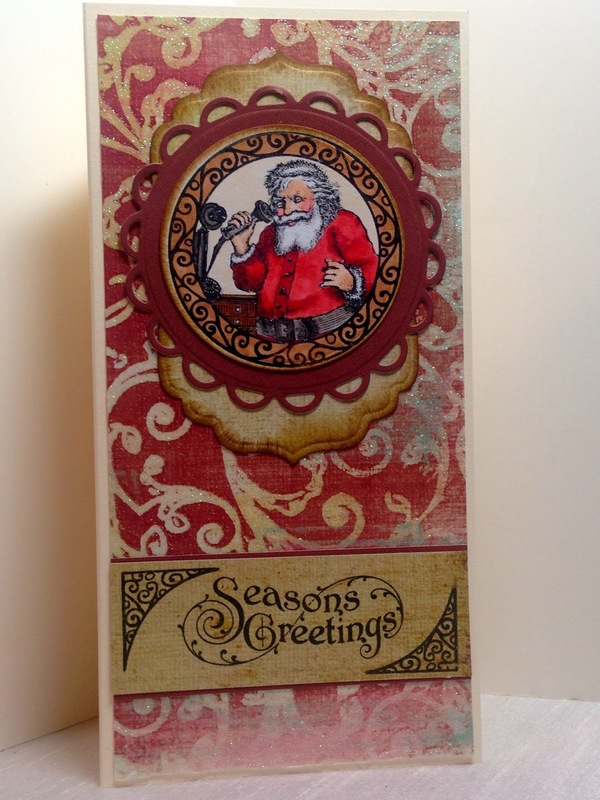 All the cards I made this month are from one Crafty Secrets set "Season's Greetings". I have a personal goal of using all my stamps at least once (some sets have never see ink, like the one I'm using today), and using EVERY SINGLE STAMP in the set. I accomplished both those goals with this month's cards, although if your familiar with the set, you might not see all the images because they are stamped on the inside of the cards. I made three of this card because it was my favorite image in the set. 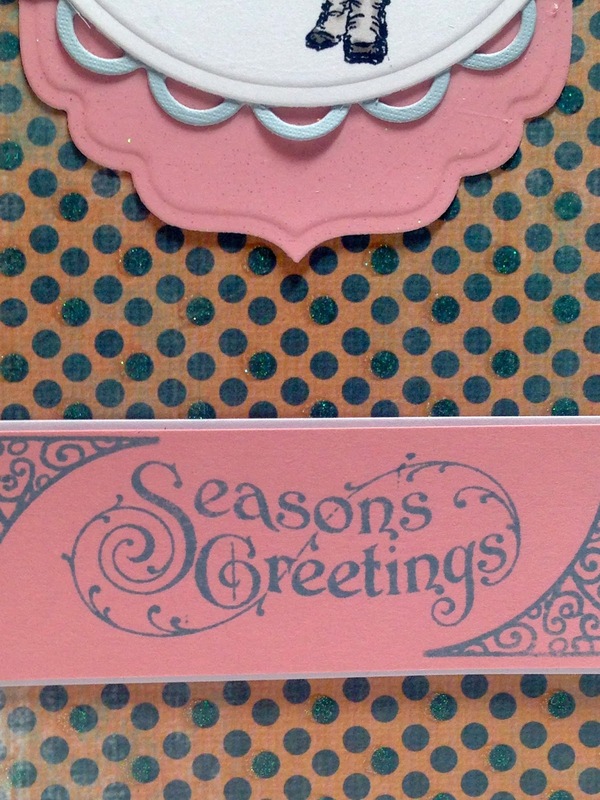 All the designer paper in all three cards has glitter and I used glitter paper behind the circular panels. I used Spellbinder's Nestabilities to cut all the different shapes of the panels. 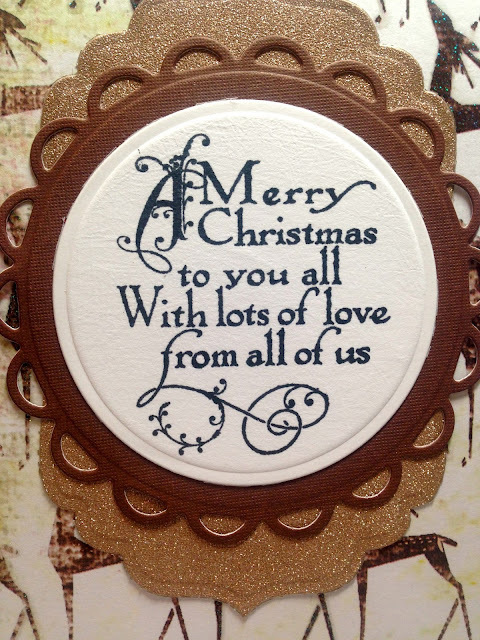 I stamped the sentiment with Bashful Blue ink and adhered the sentiment panel to the card with two white brads. I put red Stickles on all the berries. 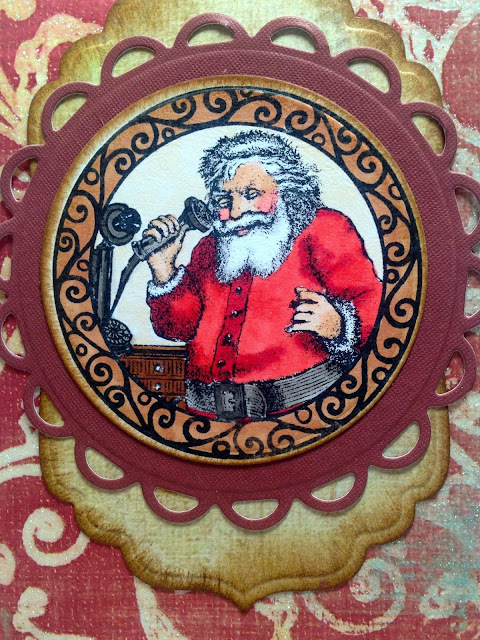 Although I love this image of a vintage Santa, I'm not really into Santa Claus images, so I only made one of this card. I used Tim Holz Distress Inks to edge the designer paper a bit. And my final card I also only made one of. Because the last image in the set was so small, I made the sentiment the focal point and used the little Santa as an accent. 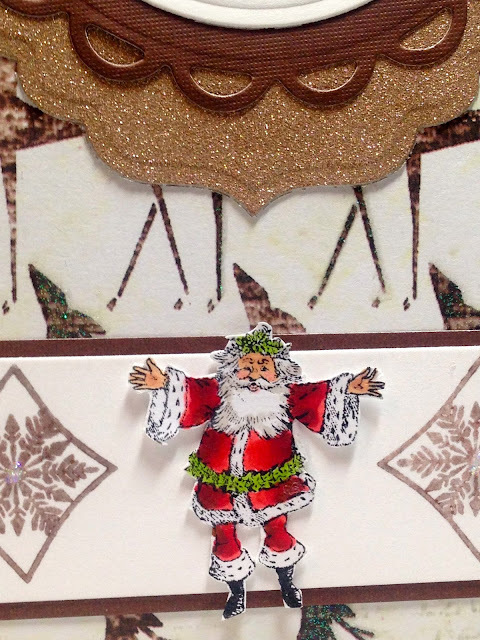 I also picked glittery reindeer paper for the background to add more 'images' to the card that coordinated with the Santa. I used brown/gold glitter paper behind the circular panels. 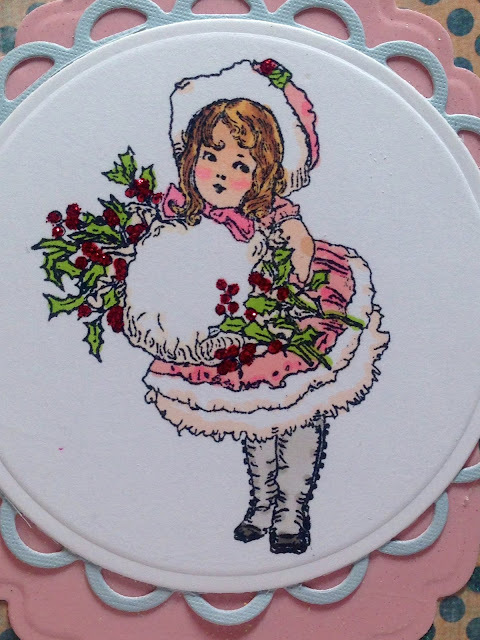 The Santa was stamped separately, cut out, and adhered to the sentiment panel. The snowflakes were also in the set. I stamped those in Close to Cocoa ink. I tried to use a brown red when coloring this Santa so he would blend with the card more. I really don't like the red against all the brown, but, could a Santa's coat be any color but red? thank for your sweet comment. You've been SO busy! What a great post...love your cards, Amy! Each one is so different, and beautiful! Thanks for sharing! 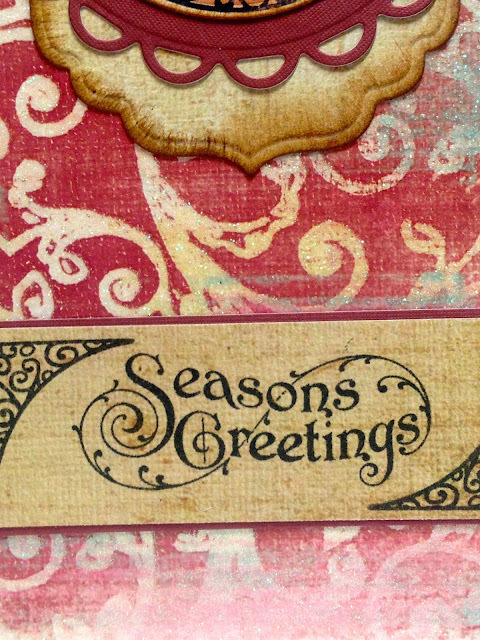 That's a good idea to make cards all year so that you're not overwhelmed during Christmas season. 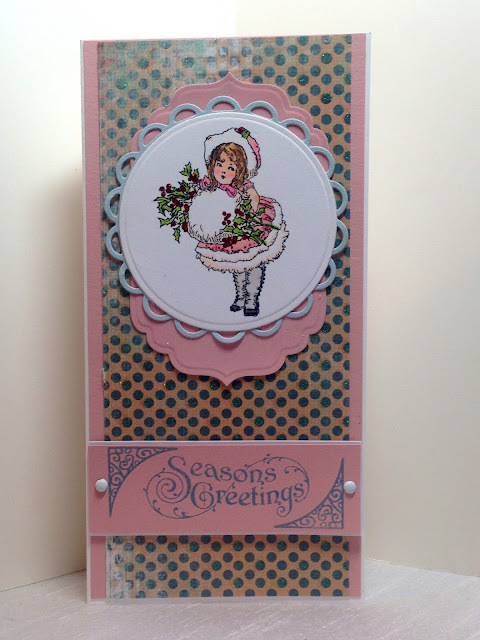 I love how your cards turned out too--I love all the details, like the polka dot background. I like all three cards! So very nicely done! But I have to admit that I have a favorite! The first one! My favorite color is pink! And I like anything vintage! So this card is a winner with me!! !